WOODLAWN — Despite the cold and snow, about 100 people gathered at the grave site of Mayor Harold Washington to remember his legacy after he died 26 years ago. 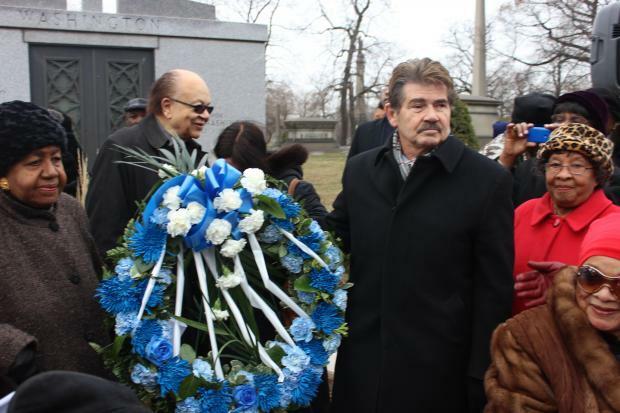 A wreath-laying ceremony at Oak Woods Cemetery was organized by the Harold Washington Tribute Committee as a way of "keeping Harold's legacy alive," said Josie Childs, chairman of the 25-member committee. Current and former elected officials were among those attending the event including former Cook County Board President Todd Stroger, former Cook County Commissioner Robert Shaw and state Rep. Mary Flowers (D-31st), who replaced Washington in the Illinois House. "He is responsible for me becoming a state representative," Flowers said. "He believed in me when I had doubts about whether I should seek office. I will be forever grateful to him." Flowers said nothing could have prepared her for the shock she felt when she heard the news on Nov. 25, 1987 that Washington, the city's first black mayor, died of a heart attack. "I was running late to meet the mayor, and I remember parking my car and running inside City Hall," she said. At that point, she was still unaware of his condition. "Security told me the mayor was on his way down and for me to stand by the elevator," Flowers recalled. "But when that elevator door opened, Mayor Washington was laid out on a stretcher with his face uncovered. I knew then he was no longer with us." According to the Cook County Medical Examiner's Office, Washington died from a heart attack he suffered during a meeting at City Hall. During Monday's ceremony, Cook County Clerk David Orr — who served as interim mayor until the City Council voted the late Mayor Eugene Sawyer in office — and Illinois Supreme Court Justice Charles Freeman laid the wreath at Washington's tombstone. Carol Adams, president and CEO of the DuSable Museum of African American History, reminded the crowd that before Washington became mayor the black community was crying out for a black mayor. "You wanted him and you got him," she said. "We just did not have him long enough." "We salute him and thank him for everything he did for this city," Adams said. And the Rev. Jesse Jackson told the crowd that Washington "sought to be fair even though there were those hitting below the belt. He sought to even the playing field after years of it being broken," Jackson said. He criticized Gov. Pat Quinn and Mayor Rahm Emanuel for not attending the wreath laying. "We wonder why the current mayor or the governor is not here today," Jackson said. "But their absence will not drive us away from this internal flame of hope." The governor was downstate in Brookport delivering supplies to tornado victims and unable to attend, his press office said. And the mayor was with Vice President Joe Biden at a groundbreaking for a new domestic violence shelter in Chicago Lawn. In a statement, Emanuel said Washington will never be forgotten for the countless contributions he made to the city. A youth choir performed at the event and Darica Benton, 15, who sang the national anthem at the 2012 Chicago Football Classic at Soldier Field, performed "Lift Every Voice and Sing." A free reception followed the ceremony at the Harold Washington Cultural Center in Bronzeville, which former Ald. Dorothy Tillman sponsored. Washington appointed Tillman as third ward alderman in 1984. Retired Chicago police officer Thomas Wortham III recalled campaigning for Washington and then working on his security detail in 1983. "Before Mayor Washington announced his campaign for mayor I was already volunteering to get him elected because he represented hope. It was a new beginning once he was elected. He opened up a lot of doors for a lot of people," said Wortham, a community activist in Chatham. "My fondest memory of the mayor was when he used words that sent reporters to the dictionary. He had a wide vocabulary and used it often like a smart man should." Historian Timuel Black said he hopes others will try to follow in Washington's footsteps. "We may someday get another black mayor but we will never have another Harold Washington. He broke glass ceilings in Chicago for black politicians and set the standard for other mayors to follow," Black said.